Expo Veneto: "Come and visit us, we will tell you our summer"
Pangyayari > "Come and visit us, we will tell you our summer"
"COME AND VISIT US, WE WILL TELL YOU OUR SUMMER" The final day of the Summer Camp, "Eat Fit", where children and old people will tell the experiences they have lived during their shared summer walk. The main theme will be the nutrition seen through children’s and old people’s eyes. On July 31 2015 at the Elderly People’s Service Centre "Villa Delle Magnolie" the event "Come and visit us, we will tell you our summer" will take place. It will be a moment of exchanging and sharing of experiences and we will show you the relationship that has been developed between grand parents and children during the summer period. The main purpose of the Summer Camp is to offer participants a pleasant and creative experience through educational, training and recreation activities on the theme of nutrition, according with Milan Expo 2015 Annual event. What makes this event and the Day of 31st July UNIQUE, is to create, not only an amusing moment, but also a way through which children can meet each other and come into contact with new realities, in a space rich of incentives and values letting them share their experiences between themselves and with the elderly people living at Villa delle Magnolie. The activities will be followed by a graduated and qualified staff, and they will be prepared together with the elderly people living the structure; in this way the two worlds of children and elderly people will meet and relate, an experience which is more and more frequent in our everyday life. The initiative of the Summer Camp, which has started from this year, is the desire of Villa delle Magnolie’s ownership in order to offer the territory a more and more innovative service, focused on the involved individuals, as a result of the synergy between wellness, health and growth during the different ages of life. On July 31 educational-training activities and a traveling interactive exhibition about nutrition will be proposed. The day will finish with a concert of French Music of South American inspiration, composed for the harp quartet and performed by the "Adria Harp Ensemble" group. - A Micro Nursery School "La casa sull'albero" for children aged between 1 and 3 years. The structure offers to each of the three units different kinds of services in order to give the right answer to the different needs elderly people, children and their families have. The first Elderly People’s Centre in Monastier di Treviso was opened in 1976 in the wonderful location and amazing spaces of the Tramonti Venetian Villa. The peculiar garden, adorned with a lot of magnolia trees, suggested the ownership to give the Residence the name of Villa delle Magnolie. This reality was born thanks to doctor Antonio Calvani’s medical experience and his daughter Emanuela’s enthusiasm who, after graduating in psychology, was the promoter of an innovative care and assistance style, focused on the individual and his needs in a global sense, not only from a sanitary point of view. At that time Villa delle Magnolie had both social and health care high levels and a hotel-level-comfort to meet elderly people’s wants and expectations and to let them feel at home. In 1983 since the near-by Hospital "Giovanni XXIII" had moved into a new bigger building, where it is also nowadays, large spaces were made available. As the Venetian Villa spaces were not big enough to face the growing requests, renovations works began in the spaces where the hospital was. In 1998 the renovation and restructuring works were completed; the new Elderly People’s Centre moved and 130 old people found large and functional spaces. In 2002 Villa delle Magnolie got the agreement with the National Health Service Company in Treviso Ulss n.9, which nowadays recognizes the level of the offered services and gives old people the possibility to cover part of the costs through the National Health Service authorization. In 2009 the "Charter of values" was created, that is the spirit that has always distinguished Villa delle Magnolie: the central role of the host, the sense of social belonging, the enhancement of the person, the innovation, the coordination style which is shared and the passion of professional development are the values the property shares with all the professional figures. To create a reality integrated with the territory. That’s why new and different services have been made and some of the interior and exterior parts of the building have been thought to welcome the citizens and the associations of the territory.In 2013 inside the Service Centre a Micro Nursery School "La Casa sull'Albero" was born to give support to the children and families belonging to the Sogedin S.p.A Group and to the territory. The Micro Nursery School welcomes children from 12 months to 3 years in a place like home as much as possible and tries to offer afternoon and/or evening activities even to children not attending the school (up to 6 years) and their families. The pedagogical approach is that of the Reggio Emilia kindergartens, which has always been at the top as far as educational services for early childhood concern. Doctor Emanuela Calvani still supervises the managing of Villa delle Magnolie to be sure that the style of hospitality and attention to the individual continues to be followed. Villa delle Magnolie is still managed by the same company, Antonio Calvani’s inheritance, the Sogedin S.p.A Company. 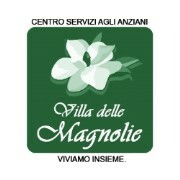 in the Hospitality Service, managing a number of hotels.Villa delle Magnolie has always been the synthesis of "the two souls" of the Sogedin S.p.A Company, guaranteeing high standards of social and health care with a constant attention to the uniqueness of each person, giving the right service according to his wants and needs.